Only 9 left! 9 items in stock. The GPS Mouse is a self contained module perfect for UAV and autonomous vehicle enthusiasts. The The GP-808G inside the Mouse is a highly sensitive GPS module that can accurately provide position, velocity, and time readings. This module is highly accurate and easy to use, requires almost no set-up time, and is very easy to embed into your projects! This 72-channel GPS receiver, that supports a standard NMEA-0183 and uBlox 8 protocol, has low power consumption of 40mA@3.3V-5.0V, GPS/QZSS/GLONASS support, and -167dBm tracking sensitivity. The GP-808G has been terminated with two two JST connectors (one 4-pin and one 2-pin) and includes their mating counterparts. The Mouse-type receiver has been a popular go-to GPS option for many of the entrants in our annual Autonomous Vehicle Competition (AVC) with great results! Note: Though the GPS Mouse does contain an enclosed compass module, we do not currently possess any software or information on how to calibrate it for use at this time. Get started with the GP-808G GPS Mouse. 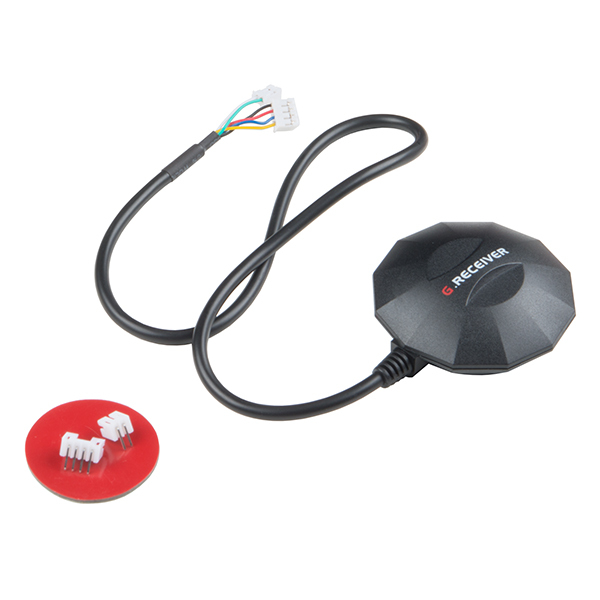 This GPS module is great for advanced projects such as autonomous vehicles. I don't see any more information on the compass part than in the headline. No NMEA sentences. Are there any applications with the compass? what are the pin numbers on the jst connectors? what type of jst connector? Any instructions or data sheets that describe how to change the update rate? Is there a way to get the time from this device, accurate to 10ms or better? One way to get the accurate time would be to access a PPS signal from the GPS module. Is that signal accessable, so that for example the SDA line could be rewired to the PPS signal? A board schematic and a datasheet for the GPS module would be helpful. For building an autonomous robot you usually need a compass and a GPS module if you want your bot to move to a given GPS location. Are these two components included in this device? It says it's capable of 10hz updates. How can I set that? For UAV project weight of all system components is extremely important. Could you please specify mass/weight of the deployed device? Not shipping weight... Thanks! Absolutely, it weighs 40.9g (0.0902lb). That information has also been added to the description as well.